It’s a drug so insidious, its oblivious users fall from cliffs, walk directly into major highways at the peak of rush hour, absentmindedly stop their cars in the middle of the road — or wrap vehicles around trees — and become the ‘unwitting’ victims of armed robberies and stabbings. But despite government propaganda criminalizing one ‘drug’ as a dangerous narcotic with no redeeming qualities or medicinal value, the substance in question isn’t cannabis — it’s Pokémon Go. Every one of the aforementioned incidents — and likely an untold number more — are the real-life consequences the phenomenally popular app’s users have subjected themselves to while in the drug-like haze of game play. Though an actual death has yet to be attributed to Pokémon Go, the app is already far more dangerous than cannabis. Yet cannabis, in most states, can lead to your imprisonment, extortion, and tarnishment of your permanent record, thanks to the State’s sham war on drugs. At this point, it’s virtually inevitable we’ll see a headline marking the first Pokémon Go fatality — something the State can’t even officially ascribe to its politicized Schedule I villain — no matter what propaganda would have you believe. 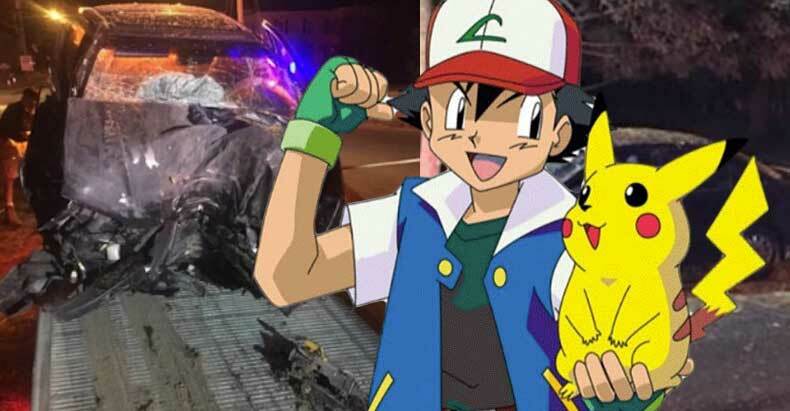 Just 30 minutes after downloading the game, 16-year-old Autumn Nolan cheated death when she wandered onto a major highway around 5 pm in a Pokémon Go-induced haze — where she was promptly struck by a car. Though the Nolans blame Pokémon Go for Autumn’s brush with death, reason and logic would argue responsibility lies in the teen’s brash decision to wander into rush hour traffic sans consideration for potential physical consequences. Another driver, in Auburn, New York, so embroiled in the digital scavenger hunt he drove into a tree, suffered relatively minor injuries — though the distracted deviation from the roadway undoubtedly could have been worse had another car or pedestrian, instead of tree, obstructed the vehicle’s path. Two friends enthralled in Pokémon Go became handy targets for an armed gunman in Antelope, California, who demanded their cellphones and proceeded to steal their car. These incidents are just a sampling from the burgeoning “Pokémon Go phenomenon” — tangible tales of hazy distraction worthy of the government’s 20th Century propaganda campaign, ‘Reefer madness’ — just replace marijuana with game mania and the effect is identical. Imminent though Pokémon Go fatalities may be, the same cannot be said of cannabis — the plant, itself, has never caused a single death — and almost certainly never will. Gaming-induced mania more aptly parallels the lessening of inhibitions caused by alcohol, prescription pills, and hard drugs; and prognostications of future deaths by Pokémon Go could draw comparisons to overdoses from those substances — all of which have skyrocketed since 2001. But while legal prescriptions and Pokémon Go could actually kill you, the only fatalities from cannabis are all due to its illegality courtesy of the war on drugs — not the plant, itself. It’s past time to end the war on drugs and demonization and prohibition of cannabis. In the meantime, use extra caution on sidewalks and roadways — lest errant Pokémon Go-ers make you the victim of the latest ‘drug’ craze.